Where can I transfer the title for my new vehicle? When is a title required for a vehicle? How do I apply for a lost or replacement title? I never received a renewal notice so I don’t have my Web PIN. How can I get a duplicate copy of my renewal? When will my plates be due for renewal? What happens if I do not pay my registration renewal within my renewal window? How much will my registration fees cost? Where do I place my new renewal sticker? Is a portion my vehicle registration fee tax deductible and if so how do I determine the amount? Who should I contact if my mailing address changes or I have a name change? How do I get a replacement registration? How do I get a replacement validation sticker? What do I do if I lost my license plates and need replacements? How do I order personalized and specialty license plates? What are decal license plates and how does my non-profit request a decal? How do I replace a personalized or specialty plate? When will my plate be replaced with the new plate design? I moved from out of state, what do I need to do in order to register and title my vehicle in Iowa? What do I need to know when selling my vehicle? 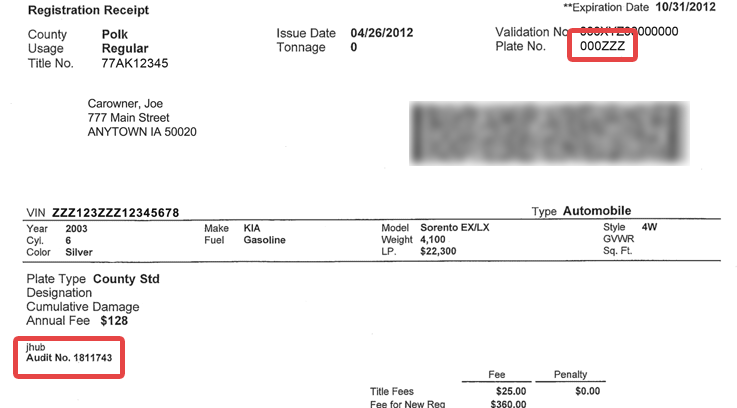 I purchased a new vehicle from a Dealer, when should I expect to receive my permanent Plates? Can I place my Vehicle in Storage? I’m in the Military, can I place my vehicle in storage while I'm on active duty? I’m in the Military, do I need to register my vehicle in Iowa if I'm stationed in Iowa while on active duty? What are the registration fees for a disabled veteran who has been provided a vehicle by the United States Government? You are required to transfer the title on your new vehicle in your county of residence. The new owner has 30 days to present the properly assigned title to his/her county treasurer so that a title can be issued in the new owner’s name. Penalties will apply after 30 days. All motor vehicles, mobile homes, travel trailers, regular trailers, and semi-trailers must be titled (exception: regular and semi-trailers with an empty weight of 2,000 lbs. or less are only registered). To calculate the estimated fees to title and register your vehicle, see our Calculate Your Transfer Fee/Credit section. Complete the Application for Replacement of Iowa Certificate of Title to a Motor Vehicle (Iowa DOT Form 411033). The application must be signed by all owners. If there is an open lien on the vehicle, the application will need to be signed by the lien holder. If there is an open lien on the title, but the lien holder does not have an interest in the vehicle any longer, they may complete a separate notarized Cancellation of Security Interest (Iowa DOT Form 411168) form. A letter from the security interest holder on their letterhead paper is acceptable if it has the following information: make, year, VIN, owners name(s) and address, and the letter must be notarized. Once the application is received either in person or by mail there is a mandatory 5-day waiting period before the replacement title is issued. The fee for a replacement title is $25.00. You are required to renew your vehicle in your county of residence. You may renew your registration online at www.IowaTaxAndTags.org if you have received a renewal notice with a PIN. You may also renew your registration by mail or you may renew in person at your County Treasurer's Office. Renewal Notices are created and mailed by a third party and counties do not have the capably to reprint renewal notices. Fortunately, you do not need a renewal notice to renew online, you just need your plate number along with a Web PIN or Audit Number. If you do not have your Web PIN, you can also use the Audit Number that is included in the bottom left portion of your current vehicle registration. See the following Example Vehicle Registration. If you do not have your current vehicle registration, you can contact your county treasurer to obtain your WEB PIN. Vehicle owners receive an annual renewal notice from their County Treasurer. These notices are sent out one month prior to the owner's renewal month. Failure to receive a notice is not a defense to the payment of the renewal amount and any penalty that has accrued. Vehicles may be renewed during a three-month window around the owner's renewal month without penalty. This includes the month prior to your renewal month, your renewal month, and the month following your renewal month. If the last day of the three-month window falls on a Saturday, Sunday, or holiday, renewals can be completed on the first business day of the following month without penalty. If you fail to pay your registration renewal within your renewal window, a penalty is assessed at a rate of 5% of the annual renewal amount, per vehicle, per month with a $5.00 per vehicle minimum. If the last day of the month is a Saturday, Sunday, or holiday, renewals can be completed on the first business day of the following month without added penalty. Registration fees are determined by Iowa Statute which factors in the type of vehicle, the manufacture’s list price, the age of the vehicle as well as the vehicles weight. To estimate your registration fee, Please see the Registration Fees by Vehicle Type Section. Your annual registration renewal sticker needs to be affixed to the rear license plate. The sticker should be affixed either on top of the prior year renewal sticker or the old renewal sticker should be removed prior to affixing the new renewal sticker. The positioning of the sticker depends on the plate type. For a large standard plate, the registration renewal sticker should be positioned in the bottom, left corner of the rear plate. See the Where Do I Place My New Sticker section for information on the placement for other plate types including example images. If you itemize deduct on your State of Iowa personal income taxes, a portion of your vehicle registration fee may be tax deductible. To determine what portion, if any, please review the following Iowa Department of Revenue Vehicle Registration Fee Deduction Worksheet. Mailing Address changes can be made by contacting your County Treasurer. When a vehicle owner’s legal name has changed, the vehicle owner is not required to obtain a corrected title with the owner’s new name, but must obtain a replacement registration card that reflects the owner’s new name. Before requesting a replacement registration, you must have updated your new legal name on your Iowa Driver’s License. See the Iowa DOT website for more information on how to update your legal name on your Iowa Drivers License. You will need to contact your County Treasurer and provide the plate number of the vehicle which needs a replacement registration. The cost of a replacement registration is $3.00. You will need to turn in your current registration with your County Treasurer and indicate that you need a replacement validation sticker. If you do not have the current registration, the cost is $3.00 for a replacement registration. Indicate that you need both, registration and validation sticker. You need to return your registration and any remaining plates that are on the vehicle to your County Treasurer. The cost for replacement plates is $5.00. If you do not have your registration the cost is $8.00. This process does not apply to personalized or specialty plates. The replacement plate fee may be waived if the plate is lost in a documented accident. Proof of the accident would need to be presented at the time the replacement plate is issued. The Iowa Department of Transportation (IDOT) offers a variety of personalized and specialty plates that can be ordered online through the IDOT website or by completing the Special Plate Application, also downloaded from the IDOT website. Visit the Iowa Department of Transportation's website to find more on what personalized and specialty plates are offered. Non-profit organizations may apply to the Iowa Department of Transportation’s Office of Vehicle & Motor Carrier Services (OVMCS) for approval of a decal recognizing their organization or cause. If approved, the non-profit organization will be responsible for the production, administration, and issuance of the decals. The non-profit organization may also charge a fee to individuals interested in displaying the approved decal on a decal license plate. For more information or to request an application for approval of a non-profit organization decal, contact OVMCS at 515-237-3110 or email vehser@iowadot.us. A list of current decals available for placement on the decal plate can be found on the Iowa Department of Transportation website. You will need to bring your registration to your County Treasurer and the duplicate plate is ordered through the County Treasurer's office. The cost is $5.00. The County Treasurer will notify you when the plate has been delivered to the Treasurer’s Office, at which time you will bring in your registration to pick up your duplicate personalized or specialty plate. Some specialty plates that are not personalized are kept and issued in the County Treasurer's office. To find out if yours is one of these, call your local County Treasurer's office. You will need to bring in any remaining plate(s) that is on the vehicle. The Plate Replacement Cycle is a program that the Department of Transportation is implementing for license plates that are 10 years old or older and are still on a vehicle. The life span of a license plate is about 10 years. The goal is to replace plates so there is never a license plate on any vehicle over 10 years old. You will need to have your current registration, title, or a copy of your title. All owners will need to complete and sign the Application for Iowa Title. Iowa law requires you to register your motor vehicle with the County Treasurer's office in your county of residence within 30 days from the date a vehicle is brought into Iowa. Iowa registration is required even though your license plates may still be valid in another state. All applicable fees will be paid at the time of registering. If the vehicle is a lease vehicle, the lessee will need to sign the Application for Iowa Title. The lessee will also be required to pay 5% one-time registration fee on the remaining balance of the lease. Yes. If you can prove your vehicle is registered in the other state a refund will be issued on the unused portion of the registration payment. The calculated unused portion of the registration fee must be $10.00 or more to receive a refund. Your Iowa plates, a copy of the out-of-state registration, and the Claim for Refund (Iowa DOT Form 411047) must be submitted to the County Treasurer. To calculate the estimated unused portion of your registration, see our Calculate Your Transfer Fee/Credit section. If the unused portion of the registration is less than $10.00, you can dispose of the old plates. Iowa Statute requires dealers to submit title work for car sales to the Purchaser’s County Treasurer’s Office within 30 days of the date of sale. Once the County Treasurer receives the properly completed title work from the dealer, the County Treasurer has an additional 14 days to process the title and mail out the new registration. To place your vehicle in storage, you must surrender your license plates and registration for each vehicle to the Treasurer on or before the last day of the month following the owner's registration renewal month. You can re-register your vehicle at any time in the future with the payment of the full annual tax due at that time. You CANNOT store any delinquent plate or first ½ truck, truck tractor or farm special plate. Military Storage in Time of War. If the vehicle is registered for the current year and the owner has entered the military service of the United States in time of war and the vehicle has been placed in storage, a refund may be applied for on the unexpired months of the registration year by making a verbal statement. Registration plates must be turned in. Upon the owner's return to the state of Iowa, the vehicle will be registered for the remaining months of the registration year. A member of the armed forces who is a resident of this state must pay the same registration fees that apply to other residents when registering a vehicle in this state. A nonresident member of the armed forces is not required to register a vehicle in this state, providing the vehicle is properly registered in the state of residency of the nonresident or the state where the nonresident is stationed. The fee on a passenger car or multipurpose vehicle are based on vehicle weight; the part based on value is not included. Application for registration of a passenger car or multipurpose vehicle must include a certification of residency, attested to by the commanding officer of the nonresident. Seriously disabled veterans who have been provided with a vehicle by the United States Government under the provisions of sections 1901 to 1903, Title 38 of the United States Code, (38 Code S.C. Section 1901 et seq. 1970) may obtain disabled veteran plates without payment of any registration fee or special plate fee. Disabled Veteran plates may be obtained for one motor vehicle owned in whole or in part by a seriously disabled veteran who has been provided with a vehicle by the United States Government under federal law. The application must be made to the County Treasurer of the county of residence of the applicant. The applicant must file a certification from the Veteran's Administration, indicating the person has been provided with a vehicle under sections 1901-1903, Title 38, United States code. That must be filed when the original application is made for the special plates. The certification is not required for renewal of registration. The Disabled Veteran plates may be obtained without payment of any registration fee and may be renewed without cost. The Disabled Veteran plates and registration card will be issued in exchange for any regular plates or registration card that may have been issued to the applicant. The Disabled Veteran plates may be transferred to another vehicle in the same manner as regular plates. Upon transfer of ownership of the vehicle to a person not entitled to the exemption, the registration fee must be paid for the remaining months of the registration year. Upon the death of the veteran, the registration fee must be paid for the remaining months of the registration year, beginning with the first day of the month following the month of death of the veteran. Special or personalized plates may be obtained by paying the difference between the fee for a regular registration plate and the fee for the special or personalized registration plate.